The Black Pill is a mystery thriller by Gino Cox that follows Ashley Wainwright, a freelance journalist, who is investigating a homicide that she believes is tied to an organ smuggling organization. Impulsive, eccentric, and very headstrong, she follows some small leads from a murder in Los Angeles to Haiti. Meanwhile, one of the best kidney transplant surgeons in the country, Dr. Hector Santamaria, must find a kidney for his wife, Anjuliet, who suffers from several rare medical conditions that make finding a match impossible. His daughter Taheisha works as a detective and is assigned to the homicide that Ashley has been investigating. Each of them converges in Haiti where they are redirected to Suriname in pursuit of the mysterious Prometheus, also known as the Black Pill. Their search revolves around a mysterious doctor, Hua Lang, and his assistant, Jade. However, the mystery grows more complicated as personal considerations make their way into the picture and each of them faces the same question regarding the organ trade. "Who should decide who lives and who dies?" While the story suffers from the lack of an editor, various ambiguities throughout the plot, and some inconsistencies in the characters, it does provide a thrilling look at the human organ trade. Because Gino Cox does an excellent job in presenting the human side of each character, it is impossible not to find yourself rooting for each character in the story, regardless of whether they are good or bad. There is some violence and suggestive romantic content, which makes it suitable only for adult reading. The main theme focuses on exposing both sides of the human organ trade. Balancing the needs of those dying with the health and rights of donors proves to be a difficult, if not impossible, task. The Black Pill definitely presents a gripping tale that plunges headlong into the murky depths of organ smuggling, but it would benefit from an editor and better organization. "Who should decide who lives and who dies?" Gino Cox grew up in Wilmette, Illinois on Chicago's north shore. He studied economics at Rockford College and marketing at Northwestern University's J.L. Kellogg Graduate School of Management. He eventually moved to Malibu, California, where he worked for various entertainment companies, including a stint as general manager of Fleshwound Films, a company that produces extreme sports videos and live events, and is credited as production manager for Crusty Demons: 9 Lives. While in California, he wrote, directed and produced a series of comedies for cable television and wrote several screenplays that received critical success in several minor competitions. 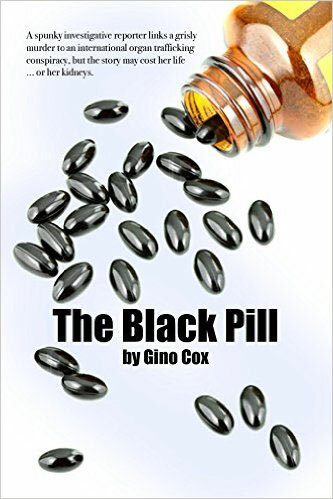 While The Black Pill is Gino's first novel, based on his screenplay by the same title, it is not his first story, and benefits from his prior experience writing screenplays and writing/directing comedies. As reviewers have noted, it reads like a movie in that it is highly visual and tightly paced. 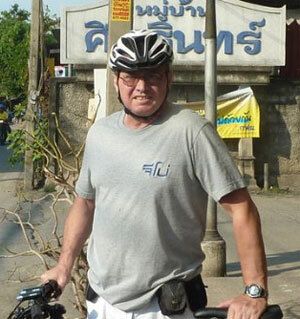 Gino now lives, works and writes in Southeast Asia. One of his avocations is writing and producing language instruction videos in Thai and Tagalog which can be viewed on his YouTube channel.